Color work is a popular form of knitting for projects of all types and complexity. Knitting is more fun when two or more colors are used and gives the knitter an opportunity to learn new techniques. From simple repeating stripes to intricate Fair Isle patterns, two or more colors can add life and dimension to garments and accessories. 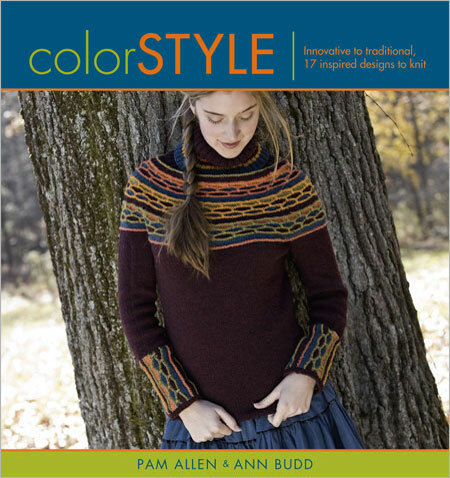 Color Style features gorgeous patterns, luscious lifestyle photographs, and step-by-step instructions. From an easy-to-knit pullover that alternates narrow stripes of solid and variegated yarns to a multicolored Fair Isle cardigan worked with steeks, readers will find loads of practical projects and inspiration from fifteen top knitwear designers including Veronik Avery, Mags Kandis, Robin Melanson, Kristin Nicholas, Shirley Paden, Mari Lynn Patrick, and more. In addition to seventeen inventive patterns, the Design Notebook chapter details the fundamental ways to incorporate color into knitting. Learn the secrets to successful Fair Isle, intarsia, and slip stitch or how different techniques can be used in combination for outstanding results.